Know the Issue – Protect Water for Future Generations. PROTECT AND PRESERVE OUR WATER FOR FUTURE GENERATIONS! Powertech Uranium is now owned by Azarga Uranium –Azarga is a Chinese company that has never mined uranium. Read more here. Uranium is power…but knowledge is more powerful. Educate yourself… Know the Hazards… Contact Government Officials… Help. There’s a uranium boom in the Black Hills region. 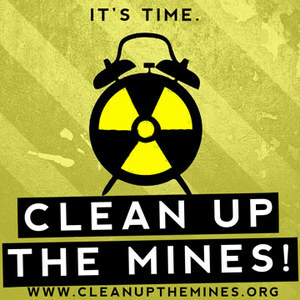 Companies are buying up mineral and surface land rights from landowners in this area and are trying to get permits to mine uranium using in situ leach mining. The time to act is NOW to prevent this from happening. Let’s make the Department of Natural Resources office uphold their slogan: Protecting South Dakota’s Tomorrow…Today. Foreign companies, most of them from Canada, want to mine local uranium. Currently, the largest markets for uranium are China and India. Uranium One, which owns in situ leach uranium projects in eastern Wyoming, is being bought by ARMZ, a company that is controlled by the Russian government. At least four companies are active in the Black Hills area – Bayswater, Uranium One, Cameco, and Azarga Uranium Corp./Powertech. In-situ operations run by Cameco have a record of ongoing spills, leaks, and water contamination. Powertech Resources Inc., is a company our neighbors in Wyoming and Colorado know all too well because of their past “inordinate number of spills” and leaks. Azarga Uranium Corp. wants to mine uranium in a similar fashion HERE, in the BLACK HILLS Region. For more history about uranium mining in the Black Hills, please check out Rapid City Journal’s special report: Radiation Legacy. They also provide a google map locating some of the historical uranium mines in the Edgemont, SD area. The EPA Public Comments are due on May 19, 2017 at 5:00 PM EST. Public Hearings schedule.